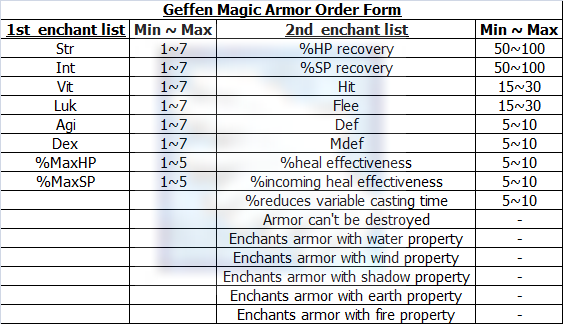 Armors and accessories obtained from Geffen Magic Tournament can be enchanted by using Geffen Magic Armor Order Form (for armor) and Geffen Magic Accessory Order Form (for accessory) as enchant material. 2 Enchants will be given randomly. Grey Abrasive has 3 types, physical, magical and distance. Each type can be enchanted on specific type of weapon too. Both Geffen Magic Tournament enchant and Ghost Palace enchant. If you get unwanted enchants﻿. You can re-enchant it as much as you want as long as you have enough material. Refine level and cards in gear still intact after enchantment. Bonus : In addition. You can exchange Knight Sakray Card with Grey Shard 10,000 ea. Unlike other enchantments. GMT, Ghost Palace, Charleston and OS enchantments are easier. Likes putting card in gear. Just double click on enchant material and available gear window will pop-up. Choose your desire gear and OK. Finish. can these enchant 'cards' be vended? Only confirm for OS enchant material that can be vended. I have no idea about the rest either.